The truth is out there, or at least it used to be. Now it's right here, overhead, bombarding the streets of GTA 5's Los Santos. 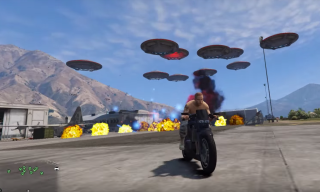 The UFO Invasion mod gives you a nice look at GTA 5's elusive flying saucers by having them hover in the sky, blasting the city (and you) with deadly blue lasers, and sucking up cars and citizens (and you!) with tractor beams. As you can see in the video above, you can choose how many UFOs you want to spawn once you've installed and activated the mod. Three look like more than enough, but the second half of the video shows 20 alien spacecraft, which creates a real Independence Day-style assault. You can take the flying saucers down with repeated rocket attacks, if you can stay on your feet long enough. I'm not sure what Los Santos did to anger those aliens, but if I had to guess it was probably all that obnoxious talk radio being beamed into space. You can download the UFO invasion mod here. It requires Script Hook 5 and Community Scripthook 5 Net.